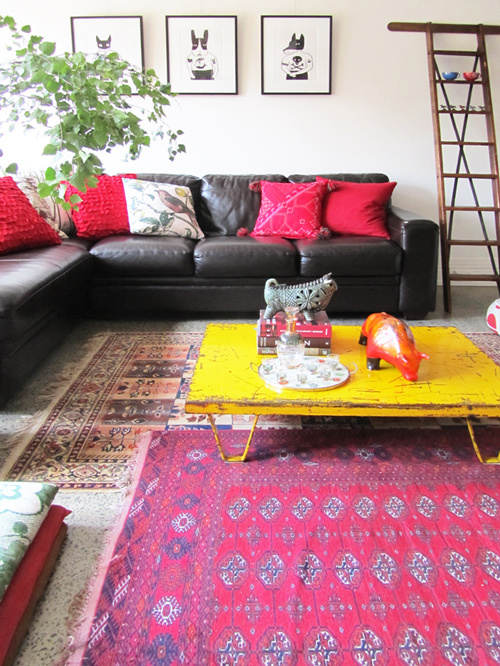 A look we love is multiple rugs layered one on top of another. 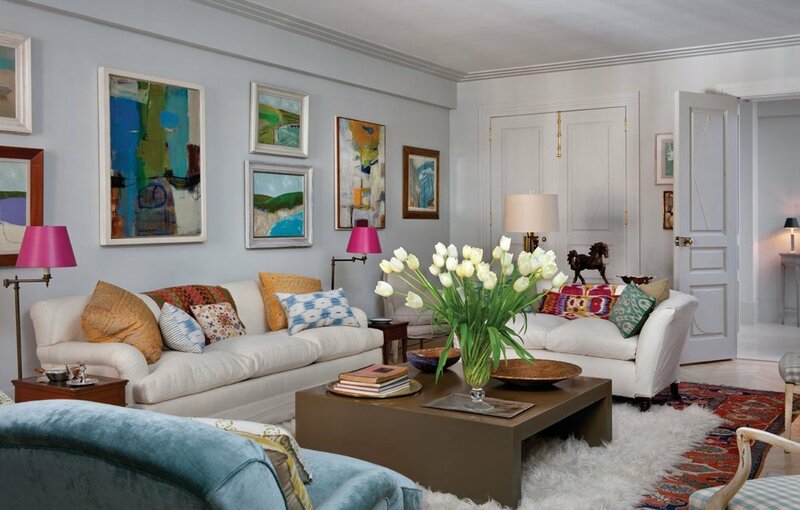 We’re not talking about small, fancy persian rugs layered over sisal or jute – although we love that look too – instead we’re taking a look at rugs layered in a more carefree, jaunty way. 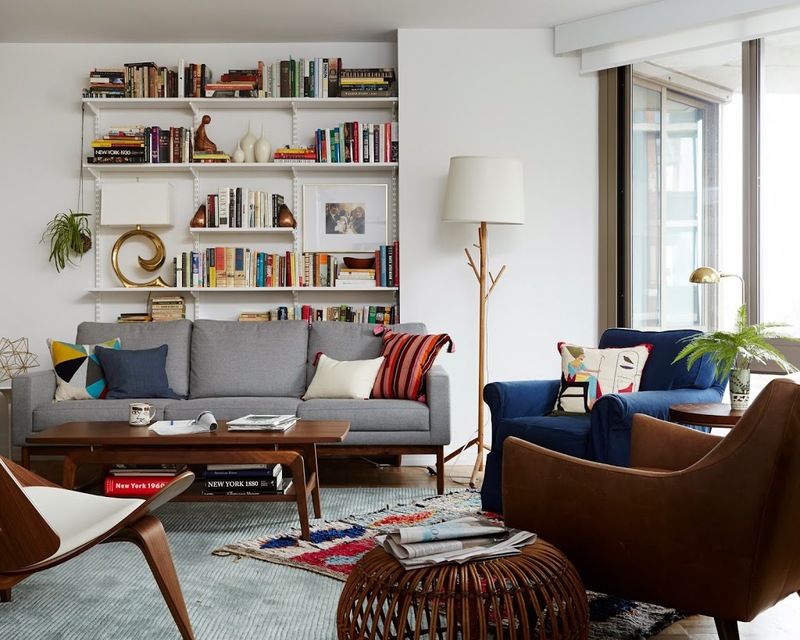 We like the insouciant drama of rugs that are strewn about, overlapping, or laid at an angle, and we love the added texture and interest such an arrangement can bring to a room. This room is ultra luxurious and fancy. 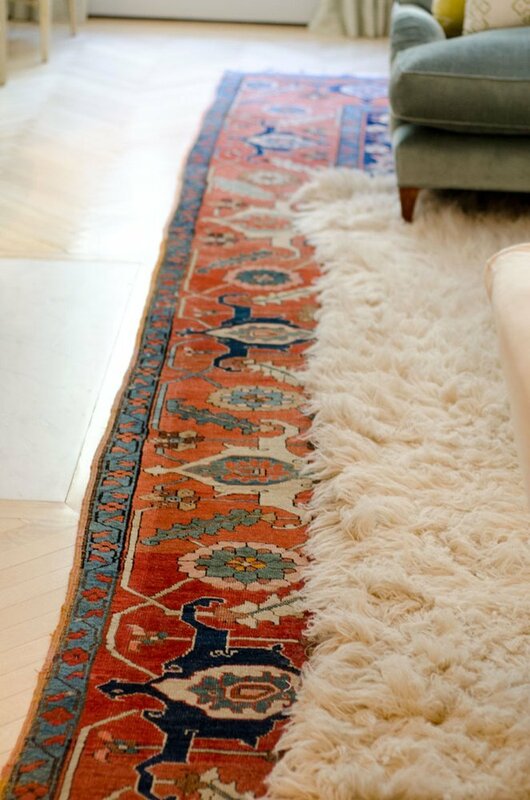 Although it doesn’t tickle all of our style bones, the flokati layered over the Persian rug is a cozy surprise. This space is also pretty formal, but the layered rugs keep it from seeming stuffy. Their uneven placement creates a beautiful and inviting path to the window seat. 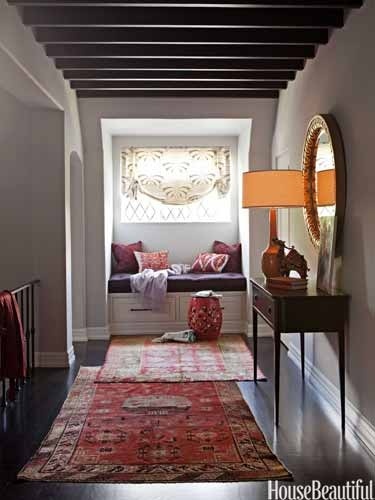 The layered patterns of the rugs in this bedroom are a clever way to add warmth to an otherwise minimalist space. 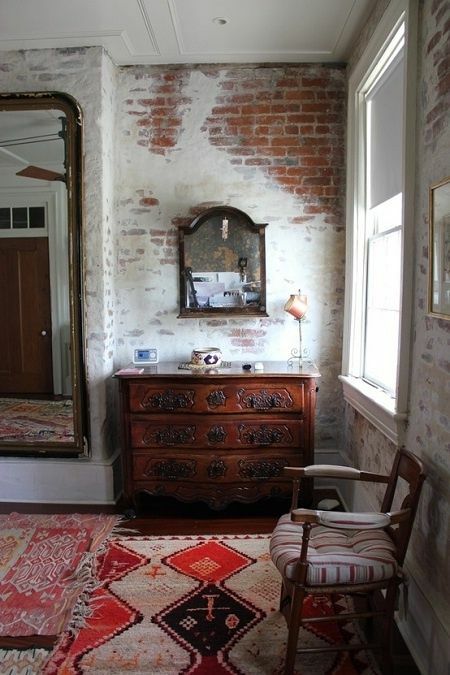 Picture this room without layered rug corners; pretty, but not particularly exciting or interesting. That little bit of shared real estate elevates the whole room. The color combination here is unexpected–peach, red, and bright yellow–but somehow it works. 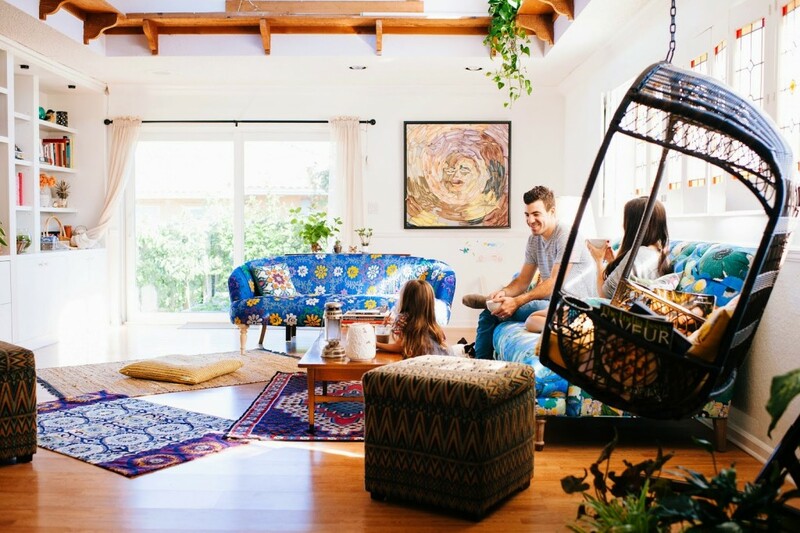 We’re surprised by how much we like this room, and can only explain it by saying its sum is greater than its parts (that couch would never cross the threshold of either of our homes). Finding a rug to fill this huge space would be really expensive, but cleverly combining these small rugs to define different zones really works. A more basic rectangle would set too formal a tone in this bright, quirky family room, but the unexpected arrangement of petite rugs works perfectly. In this small living room the layered, angled rug maximizes the usable space. If the blue chair were just sitting in the corner without the colorful boucherouite, it would feel disconnected. Its perch on the boucherouite helps bring it into the space. This space manages to look both old-world and perfectly now. For both of us, this room takes the cake. Which room is your favorite? Happy Monday! My favorite is the small living room with the blue chair. There are others I admire (the last one, the one with the window seat) but that’s the space I can see myself in. Honestly, most of these are images I enjoy looking at but in reality what I mostly think is: tripping hazard. I’m old! 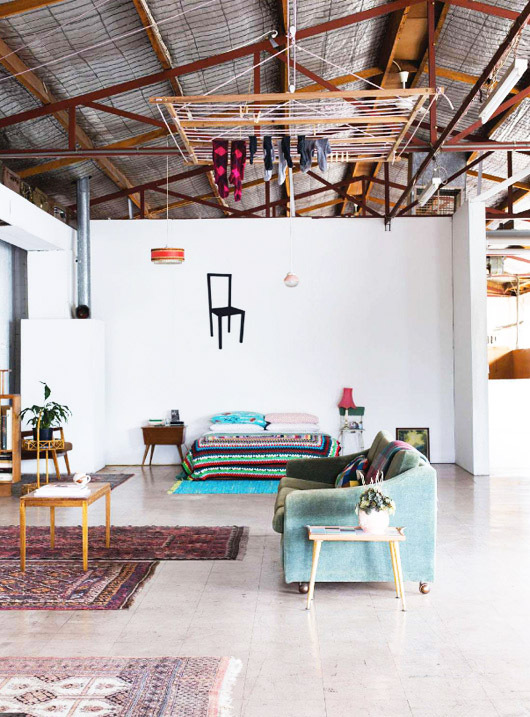 I really like the one with the hanging chair…I bought an Iraqi rug (wedding blanket) and some other things in those colours recently and am going to try for a very cheerful TV/guest room in a house I am rebuilding. 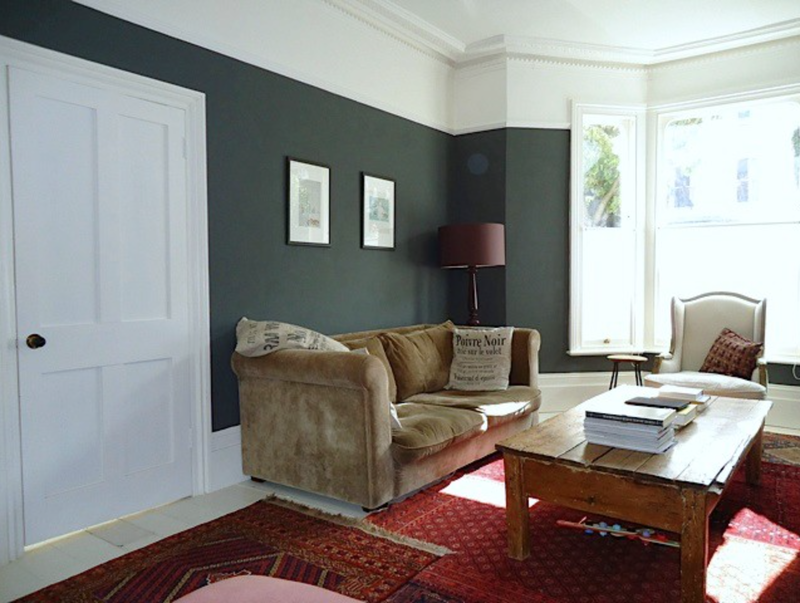 My own home has been more souk-like in the past but after a recent move where my own life went into storage and I have lived for nearly 3 years in rooms furnished from where I am, with new things bought as NEEDED, I have shifted more towards the second last. Most of the new house will be white or light-stone walls, wooden beamed ceilings and wooden floors with a more spare collection of ‘stuff’ than before. This post has me thinking about whether my extra rug, ready to be unrolled for craigslist photos, really is extra. Maybe not….